We are working on making improvements and some of the pages on this website are now responsive, that is optimised for tablets and mobile phones. Please forgive any minor glitches you may find. This opens up a form for you to complete the signup process. You can return to the website on completion. Shop for costumes, school equipment, games and toys, books and videos. All Victorian style, of course. 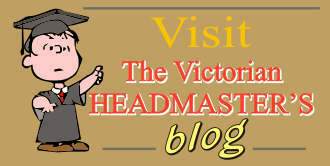 Thank you for visiting the Victorian School website. Since we started the website in 2009 we have been amazed by its popularity and we have welcomed thousands of visitors from around the globe. Although started as a hobby website, we are proud to say that it has grown tremendously and is now widely recognised as the authority on Victorian schooling. We love gettung feedback from website users and your comments and suggestions help us to shape further additions and improvements. Do enjoy your visit here, and thank you for coming. Schools throughout the UK will find a wealth of resources to support education particularly at KS1 and KS2. We supply museums throughout the UK, and offer a bulk discount on certain of our products. We are also consulted for advice and ideas. We have regular enquiries from film and TV companies who consult us on script ideas, and have provided props for many productions. We are pleased to have students use the site for their Victorian research. We always try to answer student questions, and are honoured to be consulted. For many school children today, a trip to a Victorian School or a Victorian School Day is a memorable experience that they will recall for many years to come. It is a great way to learn how things used to be. We have put together a whole range of things that can be used to enhance the experience. 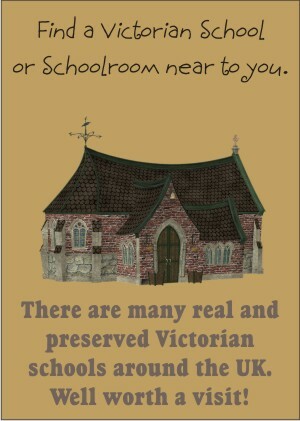 Not all schools are able to visit a real Victorian School or a recreated school, so using some of the Victorian items found on this site you can put together a Victorian School experience at your own school. We also offer a visit from a "Victorian" teacher, who can come to your own school and show you Victorian memorabilia, and teach about Victorian Schooling, giving children to dress in costume and re-enact the life of a Victorian schoolchild. Some schools like these as "Wow" Days. We also offer days which look at Domestic Life in Victorian times, and a broader look at Traditional Toys which covers how toys have changed over time. Visit us on Youtube for videos relating to the Victorian period. Are modern schools better than Victorian schools? We have also tried to include a good selection of material about the Victorian period and this will grow in the course of time. You can use this to explore and study for yourself. The Victorian era was a fascinating time and we are sure you will enjoy learning about it. We provide resources and materials for the Victorian period which is taught at Key Stage 1 and Key Stage 2. We supply costumes, traditional toys, school supplies and many more things connected with the Victorian period. We are hoping to become the definitive Victorian School Website. We need artefacts and materials that can be used for teaching purposes, to be loaned to schools. Can you help us? Here are a few of the things we are looking for: school classroom items from Victorian times to WW2, including blackboard and easel, blackboard rubber, teachers desk, pupil's school desk, small equipment, pens, inkwells, books, etc., posters, ephemera. We are also looking for a magic lantern and slides, attendance medals, Victorian and old coins, kitchen and laundry artefacts, milk churn, dairy items, washing equipment. Old school photographs, samplers, toys. We have a small budget for these items, and you can be assured that they will be used for educational purposes. Please email us or phone: details here.